arc from the publisher -- thank you! "Pretending is the brain’s work. It’s what it does. The brain can even pretend not to be itself." Let me just say at the beginning here that I loved this book, but I didn't realize how much I liked it until it was over. Add this one to your list of most-unreliable-narrator novels, or just to your list of books you should definitely read. It is a novel filled with surprises, the entire book a conversation between Andrew, a cognitive scientist whose life up to this point has been one of inadvertent disaster, and a psychotherapist/psychologist/shrink to whom he tells his "not pretty" story. Or maybe not, depending on how you choose to read it. So -- this post won't be a standard book discussion, but more my reaction to the novel, since it is really one of those books where the reader makes up his/her own mind about what's actually going on. Or not. Plus, it would sort of be unfair to spill its contents -- doing so might throw prospective readers into major spoiler alert territory. I'll say this: Andrew's Brain is something very different than anything I've seen before. Forget the usual linear narrative format, and forget any kind of basic quasi-understanding normally provided by the author that all will be explained. The book focuses on how we view brain and mind, memories, free will and fate, truth and deception, and overall how we see ourselves. At the same time, Andrew muses about the mind as a "kind of jail" for the brain, which according to him, can often pretend to be one's soul, posing the question of one's ability to actually know and understand one's self. Reading this novel took me on an interesting ride. The narrative started feeling way too random and repetitive at times, and while my normal thing to do when I read a novel with an unreliable narrator is to try and figure out what's really going on, this time I started getting frustrated and felt like giving up. But then I thought, this is E.L. Doctorow, an author I've been reading for years, so there's got to be something here I'm missing. So midway through, I started completely over, relaxed, and changed my own way of thinking about the whole thing. Suddenly the randomness and the flashes of repetition made sense, as I came to realize that this book is offering an opportunity to look through a window at how this person's traumatized brain works, making for a much better reading experience and allowing me to become more comfortable with what was going on here. 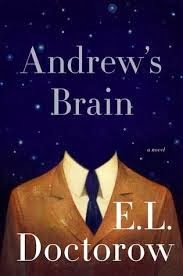 Andrew's Brain is definitely a novel where a) the reader is left to judge for himself/herself just what might be going on during these conversations, and b) you have to think outside of the box, freeing yourself from whatever expectations you might have as soon as you open the book. With apologies for being so vague here, I don't want my take on it to ruin anyone else's appreciation. This novel is getting very mixed reviews, but I found it intriguing and I had a lot of fun trying to figure things out after I'd finished it, coming up with several different interpretations of what I'd just read, all of which made perfectly good sense to me. It's often funny and is populated by some very interesting characters here and there; at the same time, it can be downright heartbreaking. You can find professional reviews that will tell you more, but I'd strongly suggest not reading them. If you must, however, I like the approach taken by the writer at The Daily Beast so I'd recommend that one. My thanks to the people at Random House -- I've given my ARC to another reader and bought a real copy of this novel to revisit later. The challenge of going through it again is just irresistible.